From the Indian Canyons entrance station, the access road winds south for 3 miles, past the turn off for Andreas & Murray canyons, ending at an elevated parking area overlooking the lower part of the oasis in Palm Canyon, and next to a tribal souvenir shop & cafe. The last section is quite steep and passes one narrow place between two tall, overhanging rocks so large vehicles including RVs have to be left half a mile before, next to a ruined building. 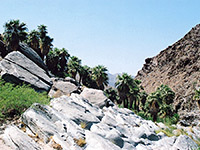 The road follows the smaller West Fork of Palm Canyon, encountering a few flourishing palms, but this is nothing to compare with the view over the main canyon, where thousands of trees grow quite densely over several miles - the biggest oasis in the world, for this type of palm, though many places in the deserts of the Middle East are larger. 20 views of Palm Canyon. The main trail runs along the canyon floor for a mile, and various other routes climb above the main and west forks of the canyon, criss-crossing the hillsides and linking with several back-country roads. 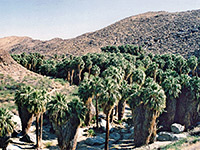 But most people just walk the first mile through the palms and perhaps hike up above in the desert for a short while, to experience the quite different surroundings of arid, rocky slopes bearing scattered cholla and barrel cacti - conditions which persist for about 2,000 feet up the slopes, until the climate becomes more temperate. From the hills, some of the town of Palm Springs can be seen in the distance. Palm Canyon is quite magnificent. It is cool and mostly shady, filled with fan palms of all sizes next to a stream which still has pools and springs in mid summer though at drier times most water flows below ground. The trees rise up to 60 feet and have trunks 3 feet across, all from the same species - Washingtonia filifera, the only palm native to western North America. A few other plants are found here, including reeds around the water, and willow & cottonwood trees on the slopes, though the palms dominate. Some small groups grow higher up the hillsides or along short side canyons, where underground water is available. The most evident wildlife are desert spiny lizards, but rattlesnakes are also quite commonly encountered, while fish and frogs live in the reflective pools and streams. The canyon climbs gradually with just one steepish place where the path detours around, otherwise the trail follows right beneath the trees, enjoying cool breezes and dark passageways even on the hottest, sunniest day. All around are fallen fronds and the tall trunks of the live trees, some bare, others encased by many years worth of dried leaves. 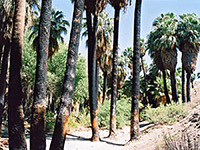 Some palms show signs of fire, a semi-regular occurrence here, but something good for the trees as mature specimens are rarely killed and the blaze serves to clear the deadwood, making space for seedlings to grow. Despite the large difference in environment, the palm groves have some similarities to the distant redwood forests of north California - both create a sense of peace and tranquility, providing a respite from the land outside.